Last night we had a very special evening. 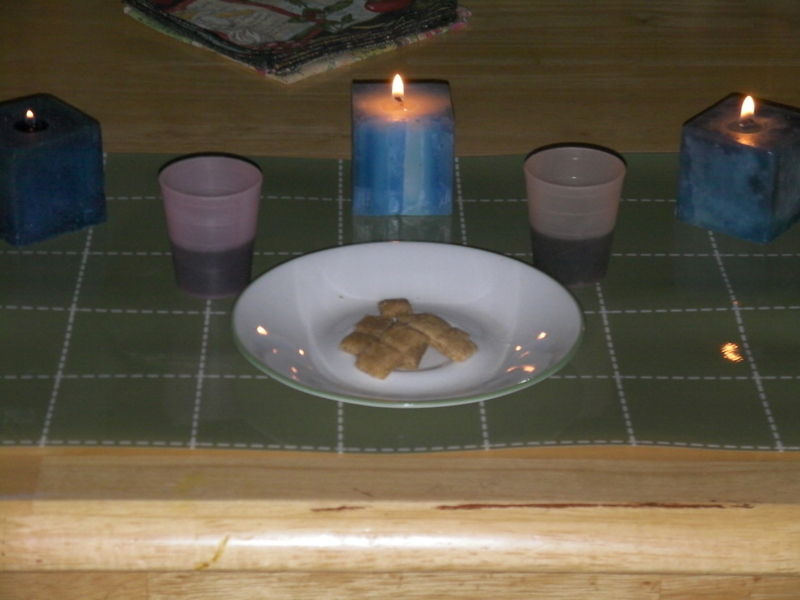 The Hoodview Church ***link*** had an Agape Feast and communion. It was a potluck-style supper of fruit, bread, and soup. After supper, we sang two songs, “At the Cross” and “Jesus, Keep Me Near the Cross.” Then we had a short homily by a young man that I assume is a pastor-in-training (we haven’t been to this church for a long time, so we are a little out-of-touch with what is happening there). Then we broke up for footwashing preparatory to communion, at which point we went home. It was almost 8:00 by this time, and Manny was what I like to call “tired wired”–you know, when toddlers get hyper because they are actually tired. Before leaving, I asked if we could take a little communion bread and grape juice home. I hadn’t participated in communion for a while, and I didn’t want to be cheated of the experience on account of the kids! Once we were home and the kids were in bed, my husband crashed on the couch and searched for a Bible passage to read, while I set out the communion meal and prepared a basin, water, and towel. 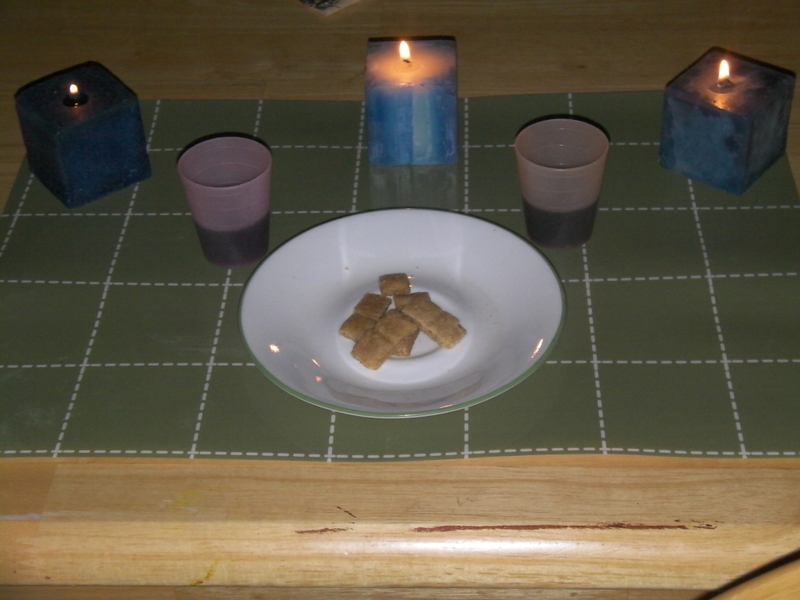 Then we shared communion together. By this time, we were both tired, so we went to bed. However, I woke early this morning. I remembered how the last time we participated in an Agape Feast at Hoodview, the pastor had walked around the cross, meditating out loud on the various wounds of Christ and His sacrifice for us. So in the wee hours before sunrise this morning, I lay quietly and did the same in my own mind. It moved me to tears. What love Jesus has for each of us! Today we go back to celebrate his resurrection. Sure, it’s a day early, but since we don’t worship on Sunday, it is more convenient to do it today. There will be a potluck brunch, ministry booths in the foyer, followed by a musical, dramatized reenactment of Jesus’ death and resurrection. I am looking forward to it! How are you celebrating Christ’s sacrifice and resurrection this weekend? Have you noticed that food prices have been going up? Even with all the bulk buying that I do, it seems that it is getting harder and harder to stay within my budget. Some months I have to supplement a few dollars of my personal money to get us through the month–or ask my husband for a little of his. There are certain meals that are rather popular in our family, but some of those are a little pricier than others. For instance, we all like scrambled tofu on sweet potatoes, but sweet potatoes are not cheap. I almost always buy them for my son, who is on such a limited diet that I get him whatever he can eat even if it’s not exactly cheap (and since he’s little, he doesn’t require large quantities, thank goodness! ), but for the rest of us, I change things around. So instead of tofu over sweet potatoes, I’ll cook some cornmeal the night before and put it into a glass bread pan. In the morning, I slice and bake. Voila! Baked cornmeal! Another favorite meal is seasoned oven fries dipped in sunflower seed sour cream mixed with avocado. When avocados get too expensive, I use tomatoes and cilantro instead (if my daughter liked spicy hot, I’d throw in a serrano pepper, but she doesn’t yet). When I run out of red potatoes (the best kind for oven fries) and money is short, I cook a pot of savory oatmeal. That is, I use a powdered chicken or beef style powdered broth to make it savory, then pour the plain sour cream over it, and add some onion rings. These onion rings are sauted in little oil with a couple dashes of salt and a quirt of lemon juice. My daughter does not like onions, but she loves this style, because the lemon juice takes the oniony taste right out. She calls them worms. That makes a rather tasty and nutritious breakfast that sticks a little longer than the oatmeal/milk/fruit breakfast that most Americans eat. Of course, we still eat some fruit if we have it, just not in the oatmeal. When I get tired of regular lentils, I grab some spices and change the flavor. Add curry powder, cumin, tumeric, and ginger powder to the fresh onions and garlic and celery that I would normally put in a pot of lentils, and suddenly they are Indian style lentils! I like to put some extra cayenne pepper on mine, especially on a cold day (of which Oregon has had a lot this summer). Serve over rice. I especially like to do this with red lentils, though it will work for just about any kind of lentil. When I decide I can’t afford to buy tofu and I’m too busy or lazy to make it (right now I have a good excuse–my tofu mold is an hour’s drive away and I don’t have a car), I make a soy souffle. This I serve over millet or quinoa or buckwheat or whatever whole grain I feel like cooking up (those 3 are our favorites for eating with souffle, though I suppose you could use rice or Bulgar wheat too). We like to eat eggplant sliced and breaded with pasta, but I only buy it once or twice a month. Pasta alone does not satisfy my husband–he needs more protein. So I found a delicious recipe for Italian white beans. My slow cooker is about 10 feet away from my tofu mold, so I just cook the white beans in my pressure cooker, add extra water and all the other ingredients, and cook on low for about half an hour or until my husband gets home. He is picky about white beans, but loves this style. I use dried tomatoes I get in a bin at the grocery store instead of the ones canned in oil, because they’re cheaper, so I find that soaking them in hot water for a while while the beans cook helps (and I can add the water to the beans too). I also use manzanilla olives instead of the olives they call for (because that’s usually what I have on hand, other than regular black olives, which would add nothing to the flavor!). Rice pasta (since I’m trying to avoid wheat) with a cheap pasta sauce doctored a little (usually extra onions and dried basil, maybe some mushrooms or olives if I feel like it) and these beans makes a complete meal. 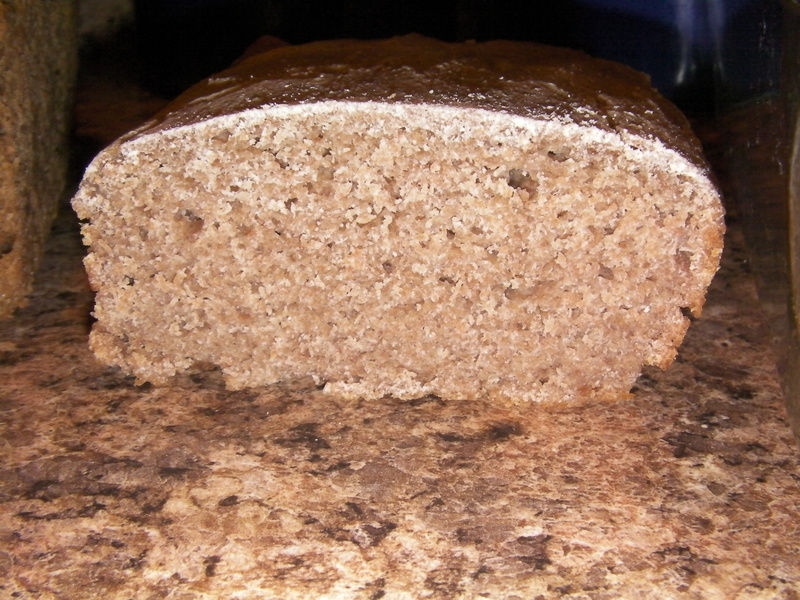 In my quest to find a substitute for wheat bread, I discovered this tasty recipe for 100% rye bread. 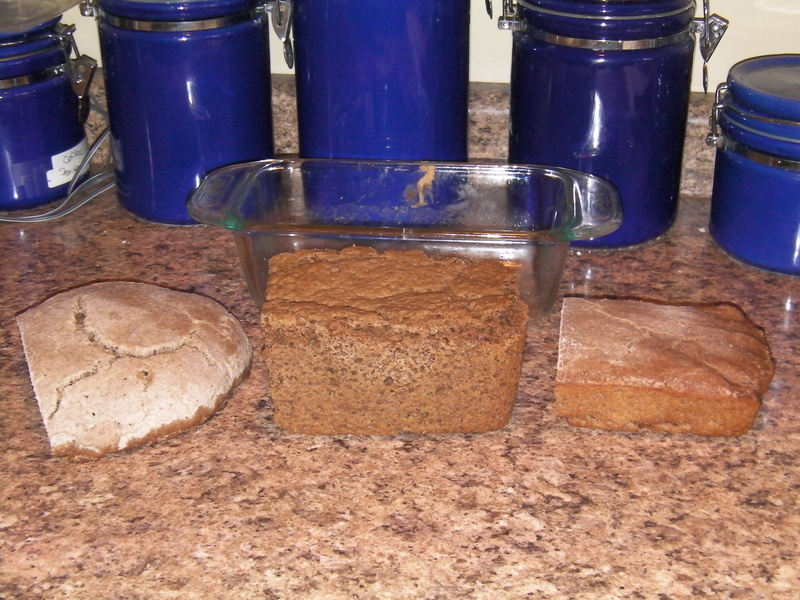 I use carob powder instead of espresso powder, but other than that, I follow the recipe to a T. It looks like a lot of work, but actually, you only have to stir it for about 3 minutes, then turn it into an oiled mixing bowl and let it rise twice before transferring it to a greased bread pan to rise again, then bake it. 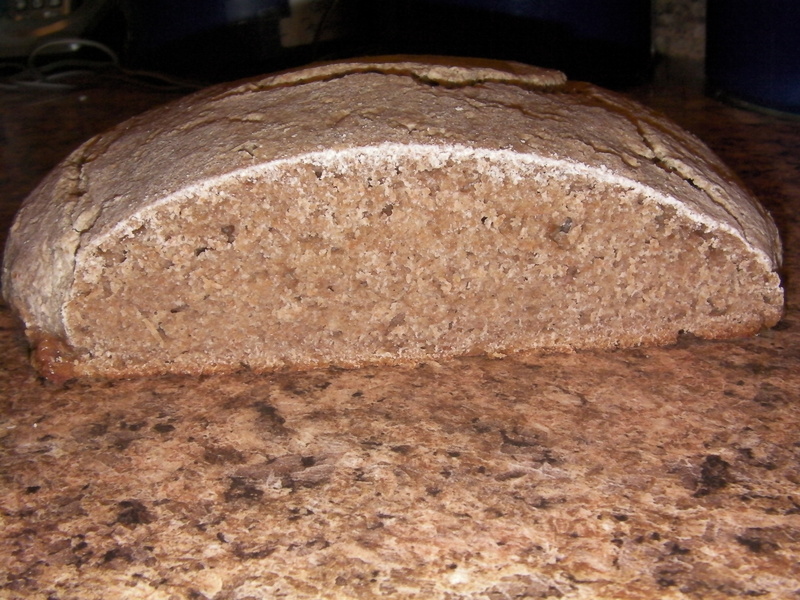 It actually rises quite nicely, and the flavor is, well, if you like rye bread, you’ll love this! It holds together well enough to work for sandwiches, and it rises enough to not be too heavy (for me, anyhow). Sure, it’s not gluten free, but I don’t seem to be bothered by gluten. Just wheat. Hasn’t stopped me from eating it entirely, but I do best if I eat it no more than once a week (of course, if I stopped eating it completely, I’d probably do even better, but I’m doing well enough to be content for the moment). 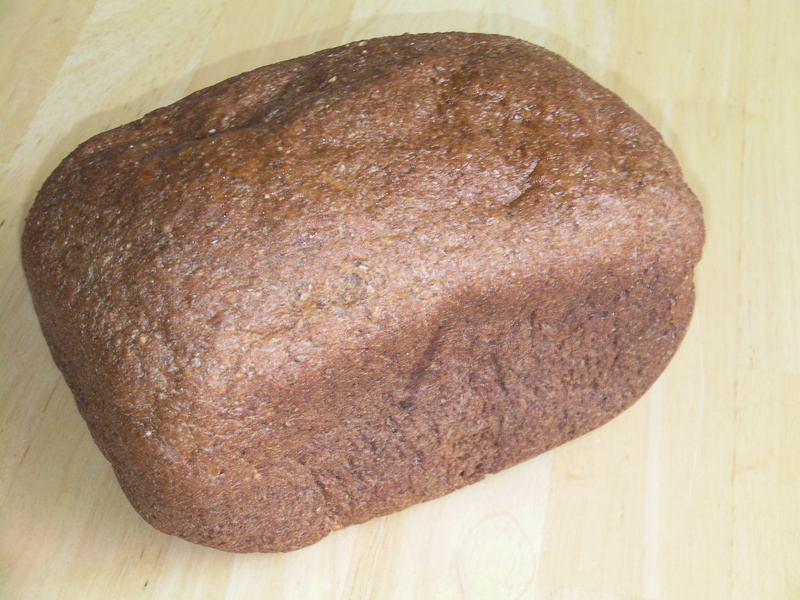 I buy organic rye flour in the 10-pound bag, so it’s actually really good bread. 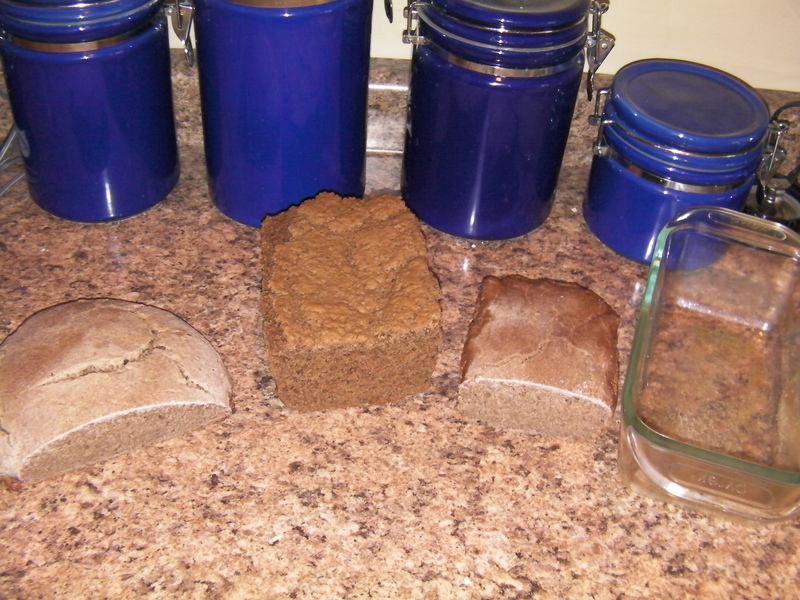 And even though rye flour is not as cheap as wheat, homemade rye bread is cheaper than a good loaf of whole wheat–or rye bread, for that matter! Well, I think the souffle we’re having for tomorrow’s breakfast has cooled enough. That means I need to get off, go brush my teeth, and hit the sack. I hope you enjoyed my musings, and hopefully you’ve gotten some ideas on how you can save money when the end of the month hits again in a few weeks and there seems to be more month than food-budget money. If you’re in the habit of buying cheap food in bulk, you’ll be sure to make it! I Love My Bread Machine! I have a friend (Hi if you are reading this) who has a dream of learning to make good bread by hand. I admire her. But I do not share her dream. I love my bread machine! I mean, I have two little kids. That explains everything, right? To save time, I decided to make an audio post–a blogcast?–about it. I recorded it on my iPod, so you will need Quicktime to listen. I put these into the machine roughly in this order. Of course, now I mix it first, so that there is no water to leak out of the pan. I set it to the fast rise wheat setting, which I have tweaked to allow a little more kneading time and a little extra rise time. Then when it beats it down after the 1st rise, I take the paddle and dough out, shape the dough, and put it back in, minus the paddle. Voila! 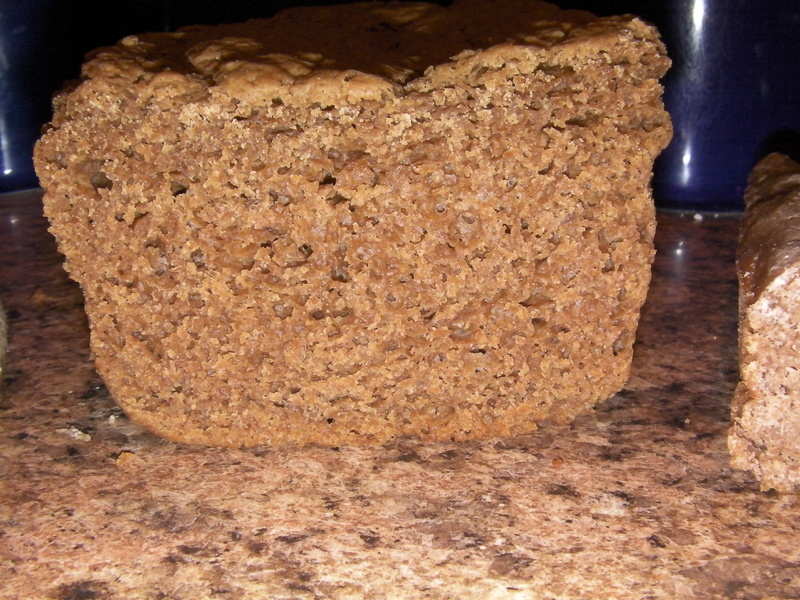 Delicious bread with very little effort! Works for me! * I actually use 2 cups of flour as finely ground as I can get it in my Champion Juicer grain grinder, and 1/2 cup of more coarsely ground flour–my husband likes it better that way. If you like lighter bread, use 1/2 cup white instead. When I make dinner rolls, I use 1 cup white and 1 1/2 cups wheat. I also find that I need to use a little extra because of the flour I use; maybe my wheat is more moist than store-bought flour would be.